Many Western diplomats and commentators expressed doubts that the Syrian people might one day rise up to demand their rights and freedoms. But those skeptics consistently understated the depth of resistance and dissent. 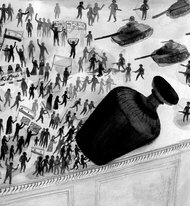 It was no surprise that at the moment of truth, Syrians opened their hearts and minds to the winds of the Arab Spring — winds that blew down the wall that had stood between the Arabs and democracy, and had imposed false choices between stability and chaos or dictatorship and Islamic extremism. History did not leave behind that other, real Syria. Syria returns today to demand its stolen rights, to collect on its overdue bills. Compared to the other Arab uprisings, Syria’s has been perhaps the most arduous, considering the regime’s cruelty and the threat of civil war. At the same time, the people’s unity and their determination to remain peaceful will ultimately enable them to win their freedom and build their own democratic experience. Our exceptionally courageous people, their bare chests exposed to snipers’ bullets, understand the meaning of this freedom; it has already cost them dearly, in the lives of their sons and daughters. In his interview with National Geographic, Bashar al-Assad did not say what he had done with the big bottle of cologne. It’s a moot point. The regime’s response, and President Assad’s last three speeches, indicate that no one in the presidential palace, not even the president, can move the glass bottle of despotism that has held Syria’s future captive. My own father governed Syria for four years, but I inherited from him neither power nor fortune. What I inherited was a small suitcase, sent to us from the prison after he died. It held literally all of his belongings after 22 years in confinement. All I remember from this suitcase today is the smell of the prison’s humidity that his clothes exuded when I opened it. The next time I visit my father’s grave, I will tell him that freedom is reviving again in Syria. I will reassure him that the Syrian people have finally succeeded in breaking this big bottle of cologne, that the scent of freedom has finally been dispersed, that it cannot be drowned by the smell of blood. Mohammad Ali Atassi is a journalist, filmmaker and human rights activist. A version of this op-ed appeared in print on June 27, 2011, on page A21 of the New York edition with the headline: My Syria, Awake Again After 40 Years.